Τhe role of the Greek Architects in shaping the architectural identity of Ottoman urban centers : Constantinople, Smyrna, Thessaloniki. 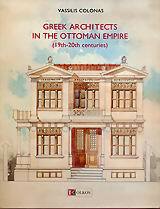 The architect Vassilis Colonas examines the role of the Greek Architects in shaping the architectural identity of Ottoman urban centers in the late 19th and early 20th centuries. The publication is richly illustrated. Publication in Greek and in English.